Yield and grade are the key factors that affect production value of peanut. The objective of this study was to identify QTLs for pod yield, hundred-seed weight, and total sound mature kernel (TSMK). A total of 90 recombinant inbred lines, derived from Tamrun OL07 and a breeding line Tx964117, were used as a mapping population and planted in Brownfield and Stephenville, Texas. A genetic map was developed using 1,211 SNP markers based on double digest restriction-site associated DNA sequencing (ddRAD-seq). A total of 10 QTLs were identified above the permutation threshold, three for yield, three for hundred-seed weight and four for TSMK, with LOD score values of 3.7 – 6.9 and phenotypic variance explained of 12.2% – 35.9%. Among those, there were several QTLs that were detected in more than one field experiment. The commonly detected QTLs in this study may be used as potential targets for future breeding program to incorporate yield and grade related traits through molecular breeding. Peanut (Arachis hypogaea L.) is the third most widely grown oilseed crop in the world, planted more than 26 million hectares in 2017 (https://apps.fas.usda.gov/psdonline/circulars/production.pdf). Peanut has an excellent nutrient profile, with high oil (40%–60%) and protein (20%–30%) content (Mallikarjuna and Varshney 2014). Among all crops in the USA, peanut is the eighth biggest crop and second biggest oilseeds crop by value, and accounts for more than US$1.6 billion production value in 2017 (http://usda.mannlib.cornell.edu/usda/current/CropValuSu/CropValuSu-02-23-2018.pdf). Texas is the second largest peanut producer in the US with 275,000 acres planting area in 2017. The average peanut production in major peanut producing states in the US is 3,941 pounds per acre, while it is 3,600 pounds per acre in Texas (https://www.nass.usda.gov/Quick_Stats/Ag_Overview/stateOverview.php?state=texas). In addition to yield, the other key aspect for peanut production is grade, which is the quality of the processed peanut. The grade of peanut can be separated into different components such as sound mature kernel (SMK), sound split kernel (SS), damage kernel (DK) and other kernel (OK), according to shelled kernel size, sound kernel rate, split kernel rate and damaged kernel rate. The importance of grade is not only to help capture higher market prices but also provides better storage conditions to prevent aflatoxin contamination (Whitaker et al. 2005). In the US peanut industry, percentage TSMK is the major criteria for peanut grading (https://www.ams.usda.gov/grades-standards/shelled-runner-type-peanuts-grades-and-standards). To improve peanut yield and quality, most previous studies have focused on field management, nematode resistance, disease resistance and other environmental controls (Wehtje et al. 1984; Faircloth and Prostko 2010; Wheeler et al. 2012; Burow et al. 2014; Arnold et al. 2017; Liang et al. 2017). Peanut is an allotetraploid crop (AABB, 2n = 4× = 40) which hybridized naturally from two diploid wild species, A. duranesis (AA) and A. ipaensis (BB). The first SSR-based linkage map of cultivated peanut was developed in the last decade (Varshney et al. 2009). So far, however, there have been limited studies on improving peanut production and quality using genetic tools (Khedikar et al. 2010; Gautami et al. 2012; Wang et al. 2013; Burow et al. 2014). Compared with other major crops, research in peanut genetics is behind due to its genome complexity and low DNA polymorphism rates (Mallikarjuna and Varshney 2014). Quantitative trait loci (QTL) mapping has been used as one of the standard methods to ultimately identify the genes underlying the QTL in many crops, including rice, wheat and peanut (McCough and Doerge 1995; Buerstmayr et al. 2009). Up to now, only a few peanut QTL studies for yield and its components have been reported (Gomez Selvaraj et al. 2009; Liang et al. 2009; Varshney et al. 2009; Ravi et al. 2010; Shirasawa et al. 2012). Furthermore, no previous study has investigated QTLs corresponding to grade-related traits. Therefore, the major objective of the present study was to map QTLs affecting peanut yield and grade using the same RIL population and genetic map that we have used in our previous study in mapping QTL for leaf spot disease (Liang et al. 2017). The double digest restriction-site associated DNA sequencing (ddRAD-seq) genotyping method was used to produce the genetic map with high density SNP markers (Baird et al. 2008; Peterson et al. 2012). The RIL population was developed from a cross between an elite released cultivar, Tamrun 0L07, a runner type cultivar having high yield, good percentage of TSMK, and high oleic to linoleic fatty acid ratio (O/L) (Baring et al. 2006), and a Texas breeding line Tx964117, having high level of resistance to early and late leaf spot but only having average yield potential, poor percentage of TSMK, and normal O/L. Major QTLs detected in this study can be used as potential targets for future molecular breeding efforts to increase yield and grade in peanut. A RIL mapping population consisting of 90 lines that had been used in our previous study to identify QTLs for leaf spot disease (Liang et al. 2017), was used in this current study. The high oleic released cultivar Tamrun OL07, with high yield potential, high grade potential and resistance for Tomato spotted wilt virus (TSWV) and Sclerotinia blight was the female parent, and the breeding line Tx964117 with resistance to early and late leaf spot (unpublished data) was the male parent. Phenotypic data were collected from experimental field stations in Brownfield and Stephenville, Texas in 2010 and 2012 using F2:5 and F2:6 mapping populations, respectively. Brownfield located in West Texas has an average of 24°C to 33°C daytime temperature and 6.1 cm precipitation per month during May to October, the growing season for peanut in this region. Stephenville has an average of 25.5°C to 35°C daytime temperature and 7.9 cm precipitation per month during the growing season. With no disease history and an ideal environment for peanut cultivation, Brownfield has become the best location to test yield potential and grade of peanut. On the other hand, the Stephenville nursery has mainly been used to conduct Sclerotinia blight disease experiments. Both experimental fields were conducted by randomized complete block design (RCBD) with three replications. Plots were two-rows wide measuring 1.83 m wide by 3.05 m in length. Both parents were replicated five times as controls in each replication in both years. As previously reported in our study (Liang et al. 2017), our genotyping was performed using the restriction site association based method, ddRAD-seq (Peterson et al. 2012), digested DNA with two restriction enzymes, i.e. PstI and MluCI, with a library preparation of Peterson et al. (2012). The genotyping used Illumina HiSeq 2500v4 platform for sequencing. A total of 260,445,423 raw sequencing reads were processed, 17,341 SNPs were called, and 1,211 SNPs were used to construct the genetic map. The genetic map was constructed by MSTMAP software (Wu et al. 2008) as described in our previous study (Liang et al. 2017). Windows QTL cartographer 2.5 (Wang et al. 2012) was used to perform QTL analysis. Composite interval mapping (CIM) analysis was performed using Kosambi map function with Ri1 cross type (recombinant inbred line, derived by selfing), and forward and backward regression method was used with F-in and F-out equal to 0.01 selection criteria. Five markers were set for background control with window size of 10 cM. Permutations of 1,000 iterations were used to determine the QTL threshold. According to Lander and Kruglyak (1995) and Van Ooijen (1999), however, a LOD value just below the threshold can be used to show “suggestive linkage” of a locus that can then be compared to other studies to support if it is a real effect or not. Hence, in this study, QTLs with a LOD value of 3.0 were still presented for QTL comparison purposes, although they were not included in the final count of 10 significant QTLs detected in this study. When doing QTL analysis for experimental data from Stephenville, Sclerotinia disease severity score (DSR) was set as “other trait” to act as a covariate in the analysis. ANOVA across locations and years revealed that yield, hundred-seed weight, and TSMK had significant genotypic effect, environment effect, and genotype-by-environment effect, with P ≤ 0.001. Therefore, all phenotypic data were analyzed separately. The average yield across three environments was 2,450 g per two-row plot. However, the distribution of yield had a high variance in the three environments with an average of 1,577 g in Stephenville in 2010, 2,406 g in West Texas in 2010 and 3,366 g West Texas in 2012 (Fig. 1A) with heritability ranging from 0.36 to 0.57. The yield for the elite cultivar Tamrun OL07 was 2,389 g, 2,539 g and 3,906 g in the three environments, respectively; while Tx964117 had a plot yield of 1,598 g, 2,387 g and 3,425 g, respectively. The average hundred-seed-weight in three environments were 54.3 g in Stephenville in 2010, 63.2 g in West Texas in 2010, and 62.5 g in West Texas in 2012 (Fig. 1B) with consistent high heritability of 0.79. On average, Tamrun OL07 had 74.1 g weight whereas Tx964117 had 50.3 g. Both parents had higher hundred-seed weight in West Texas in both years, which was similar to the trend of the mapping population. TSMK was calculated as a percentage with an average of 66.8% from the measurements of 65.1%, 65.5% and 69.6% in the three environments, respectively (Fig. 1C). 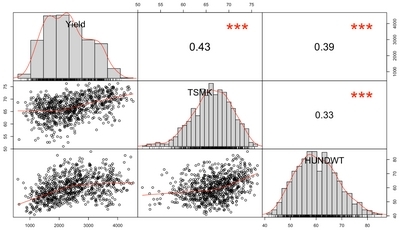 Across environments, the heritability of TSMK ranged from 0.51 to 0.60 and the average TSMK of Tamrun OL07 and Tx964117 were 73.6% and 65.3%, respectively. In total, three QTLs for pod yield were detected above the permutation threshold across three environments (Table 1, Fig. 2) with the LOD values and phenotypic variance explained (R2) ranging from 3.7 – 6.3 and 12.2% – 23.2%, respectively. Two QTLs, qY7 and qY14.1, were detected in two field experiments. q14.1 was the largest QTL being detected for yield in this study, with a LOD value of 6.3 and 3.7 and R2 of 23.2% and 12.2%, in Stephenville 2010 and West Texas 2010, respectively. qY7 had a LOD score of 4.6 and 3.9 and R2 of 15.2% and 16.3%, in Stephenville 2010 and West Texas 2012, respectively. qY12 was only detected in West Texas 2010, with a LOD value of 4.0 and R2 of 12.7%. In addition to the three main QTLs, there were four suggestive QTLs detected below the permutation threshold but above the LOD score of 3.0. These QTLs were also presented in Table 1 for QTL comparison purposes. One of these QTL, qY4, was detected in Stephenville 2010 and West Texas 2010, with LOD values of 3.4 and 3.2 and R2 of 14.3% and 10.1%, respectively. Among these seven QTLs, the yield-increased allele of qY4, qY14.1 and qY14.2 were from elite parent Tamrun OL07. On the other hand, Tx964117 contributed the allele for increasing yield in qY6, qY7 and qY12 loci. A total of three QTLs were detected above the permutation threshold for hundred-seed-weight, i.e. qWT4, qWT3, and qWT12 (Table 2, Fig. 2). Additionally, there were two suggestive QTLs detected below the permutation threshold, but both of them having LOD values of 3.0. However, none of the QTLs were detected in more than one field experiment. There were three QTLs detected in Stephenville 2010; the largest one was qWT4, having LOD 3.8 and R2 of 16.4%, with the increased allele from Tamrun OL07. Of the other two QTLs, one was derived from Tamrun OL07 and the other one was from Tx964117. In West Texas, only one QTL was detected in each year; in West Texas 2010, qWT3 was detected, having LOD 4.1 and R2 of 16.6 %; the increased allele was from Tamrun OL07; while in West Texas 2012, qWT12 was detected with LOD 5.6 and R2 was 35.9%. Interestingly, the increased allele effect of qWT12 came from Tx964117. A total of four QTLs for TSMK were detected above the permutation threshold across three environments, i.e. qTSM4, qTSM1, qTSM5.1, and qTSM19 (Table 3, Fig. 2), having a range of LOD scores of 3.8 – 6.9 and R2 of 12.2% – 28.1%. Additionally, there were three suggestive QTLs detected below the permutation threshold but having LOD scores of at least 3.0. All of the increased alleles were from Tamrun OL07 with the exception of qTSM1, qTSM7, and qTSM5.2 where the beneficial alleles came from Tx964117. One of the QTLs, qTSM4, was the largest QTL for TSMK, having LOD scores of 6.9 and 4.7 and R2 of 28.1 and 20.5 in Stephenville 2010 and West Texas 2012, respectively. Meanwhile, qTSM8 was detected in two field experiments but below the permutation threshold, having LOD scores of 3.0 and 2.7 and R2 of 28.1% and 20.5% in Stephenville 2010 and West Texas 2010, respectively. The data analysis showed that yield and hundred-seed weight were not as good in Stephenville as in West Texas (Fig. 1). The pod yield average in West Texas was 2886 g; however, it was only 1,577 g in Stephenville, resulting in a 45% decrease in yield in Stephenville. The trend stays the same for the hundred-seed weight, the average in West Texas was 62.8 g in comparison of 54.3 g in Stephenville. The poor yield performance in Stephenville is largely due to the prevalence of Sclerotinia blight. This results coincided with previous study, which revealed that Sclerotinia blight is one of the most destructive disease for peanut which may cause more than 50% yield loss (Porter and Melouk 1997). In contrast, for TSMK, there was no significant difference between Stephenville and West Texas in 2010, but it was significantly higher in West Texas in 2012 (P ≤ 0.001). A possible explanation for the difference could be the environmental effect. The environmental effect across the three experiments of TSMK was as significant as the genotypic effect (data not shown). Moreover, TSMK, yield and seed weight all were measured slightly different, yet were interrelated, as aspects of yield components and quality. Even though the correlations between the three traits were highly significant, the correlation coefficients were still lower than 0.5 (Fig. 3). Our results showed that qY4, qWT4 and qTSM4 were detected on the same region of the top of chromosome A04 (Fig. 2). Moreover, qY4 and qTSM4 were detected in more than one field experiment (Tables 1, 2). However, qY4 was detected slightly below the permutation threshold (LOD values of 3.4 and 3.2). The source of the trait-enhancing allele of these three QTLs was from the elite parent Tamrun OL07. Additionally, the three traits were significantly correlated with each other (Fig. 3). Whether these three QTLs were closely linked or pleiotropic, needs further study. Likewise, qY12 and qWT12 shared a partially overlapping region on the distal end of chromosome B02 (Fig. 2). Whether they were the same or different QTLs needs further investigation. The QTLs qY14.1 and qY14.2 were identified closely in tandem. However, in this case, qY14.2 was detected slightly below the permutation threshold (a LOD value of 3.4). The beneficial alleles of the two QTLs were derived from Tamrun OL07. Compared to our previous leaf spot study (Liang et al. 2017), qY14.1 overlapped with the leaf spot resistant QTL qLS14.2. The increased allele for yield was from Tamrun OL07, whereas the leaf spot resistant allele was from Tx964117. This indicated that the QTL conferring leaf spot resistance may also cause a yield and grade penalty. A previous study had shown that the disease resistance allele caused yield loss when there is no disease prevalence (Brown 2002). At this point, it is unclear whether this relationship is due to closely-linked genes (Worland et al. 1990) or a pleotropic effect of the disease resistant gene(s) (Sharp et al. 2002). If those traits are controlled by different genes but closely linked, the negative linkage drag could be possibly broken by increasing the size of the population. Otherwise, we could also develop lines that are higher yielding, but these lines cannot be deployed in the regions with high prevalence of leaf spot disease. In a previous QTL study it was reported that the released cultivar Tamrun OL01 has a hundred-seed weight QTL linked to the SSR marker PM375 (Gomez Selvaraj et al. 2009). The primer sequences of PM375 marker are: 5′-CGGCAACAGTTTTGATGGTT-3′ and 5′-GAAAA TATGCCGCCGTTG-3′ (He et al. 2005). Since two of the whole genome references of peanut cultivars are available (AA and BB genomes), we can simply perform BLAST search of the SSR primer sequences to identify the marker position on the chromosome. The results show that PM375 marker is located on chromosome A04. Based on the pedigree, Tamrun OL01 and Tamrun OL07 have common parents, SunOleic 95R, a high O/L ratio donor, and recurrent parent Tamrun 96, with high yield potential (Smith et al. 1998; Simpson et al. 2003; Baring et al. 2006). Our QTL for hundred-seed weight, qWT4, is also located at the same chromosome. As described above, this QTL was in a cluster with two other QTLs underlying increased yield and TMSK (qY4 and qTSM4). The results of our current study validate that the hundred-seed weight QTL on chromosome A04 is linked to the marker PM375. In the same report, a QTL for hundred-pod weight was also mapped and linked to the SSR marker Ah-041. It was also demonstrated that there was very highly significant correlation (0.92) between pod weight and seed weight (Gomez Selvaraj et al. 2009). After performing BLAST the primer sequences of Ah-041: 5′-CGCCACAAGATTAAC AGCACC-3′ and 5′-GCTGGGATCATTGTAGGGAAG G-3′ (Moretzsohn et al. 2004), the result suggests that Ah-041 is positioned on chromosome A03. This result also coincides with our seed weight QTL qWT3, which is also located on the same chromosome. Only a very few QTL studies have been reported on yield and quality related traits. In our study, the two QTLs described above are the only ones that most likely coincide with previous reported QTLs. The rest of the QTLs that we have identified are potentially novel. Some of these QTLs, especially the ones that have high phenotypic contribution and/or in a cluster with one or more other beneficial QTLs can be used as targets for molecular breeding. We thank James Grichar and Dwayne Drozt for technical assistance, and the team at the Genomics and Bioinformatics Service, Texas A&M AgriLife Research for genotyping assistance. The work reported here was supported in part by a grant from Texas A&M AgriLife Research, the Texas Peanut Producers Board, the National Peanut Board, and the National Institute of Food and Agriculture, U. S. Department of Agriculture, Hatch project 1009300. Fig. 1. Performance of the RIL population in each environment. (A) Boxplot of plot yield. (B) Boxplot of TSMK. (C) Boxplot of plot hundred seed weight. Fig. 2. Linkage map of the RIL population. The mapping population (F2:7) derived from a cross between Tamrun OL07 and Tx964117 along with the positions of QTLs for TSMK, yield, and 100-seed weight, which are indicated by the different bars. Fig. 3. Pearson correlations among yield, TSMK and 100-seed weight. ***Significant at P-value ≤ 0.001. QTL identified for yield in the RIL mapping population in 2010 and 2012. Allele A indicates the allele from Tamrun OL07, and B indicates the allele from Tx964117. ”*” for P-value ≤ 0.05 and “**” for P-value ≤ 0.01 according to 1000 times permutation. QTL identified for hundred-seed-weight in the RIL mapping population in 2010 and 2012. QTL identified for TSMK in the RIL mapping population in 2010 and 2012. ”*” for P-value ≤ 0.05 and “**” for P-value ≤ 0.01 according to 1000 times permutation; Italic indicates the QTL has LOD value between 2.5–3.0, but detected significantly in different environment. Arnold, JA, Beasley, JP, Harris, GH, Grey, TL, and Cabrera, M (2017). Effect of gypsum application rate, soil type, and soil calcium on yield, grade and seed quality of runner type peanut cultivars. Peanut Science. 44, 13-18. Baird, NA, Etter, PD, Atwood, TS, Currey, MC, Shiver, AL, and Lewis, ZA (2008). Rapid SNP discovery and genetic mapping using sequenced RAD markers. PLoS One. 3, e3376. Baring, MR, Simpson, CE, Burow, MD, Black, MC, Cason, JM, and Ayers, J (2006). Registration of ‘Tamrun OL07′ peanut. Crop Sci. 46, 2721-2722. Brown, JKM (2002). Yield penalties of disease resistance in crops. Curr Opin Plant Biol. 5, 339-344. Buerstmayr, H, Ban, T, and Anderson, JA (2009). QTL mapping and marker-assisted selection for Fusarium head blight resistance in wheat: a review. Plant Breed. 128, 1-26. Burow, MD, Starr, JL, Park, C-H, Simpson, CE, and Paterson, AH (2014). Introgression of homeologous quantitative trait loci (QTLs) for resistance to the root-knot nematode [Meloidogyne arenaria (Neal) chitwood] in an advanced backcross-QTL population of peanut (Arachis hypogaea L.). Mol Breed. 34, 393-406. Faircloth, WH, and Prostko, EP (2010). Effect of imazapic and 2,4-DB on peanut yield, grade, and seed germination. Peanut Science. 37, 78-82. Gautami, B, Foncéka, D, Pandey, MK, Moretzsohn, MC, Sujay, V, and Qin, H (2012). An international reference consensus genetic map with 897 marker loci based on 11 mapping populations for tetraploid groundnut (Arachis hypogaea L.). PLoS One. 7, e41213. Gomez Selvaraj, M, Narayana, M, Schubert, AM, Ayers, JL, Baring, MR, and Burow, MD (2009). Identification of QTLs for pod and kernel traits in cultivated peanut by bulked segregant analysis. Electron J Biotechnol. 12, 1-10. He, G, Meng, R, Gao, H, Guo, B, Gao, G, and Newman, M (2005). Simple sequence repeat markers for botanical varieties of cultivated peanut (Arachis hypogaea L.). Euphytica. 142, 131-136. Khedikar, YP, Gowda, MVC, Sarvamangala, C, Patgar, KV, Upadhyaya, HD, and Varshney, RK (2010). A QTL study on late leaf spot and rust revealed one major QTL for molecular breeding for rust resistance in groundnut (Arachis hypogaea L.). Theor Appl Genet. 121, 971-984. Lander, E, and Kruglyak, L (1995). Genetic dissection of complex traits: guidelines for interpreting and reporting linkage results. Nat Genet. 11, 241-247. Liang, X, Zhou, G, Hong, Y, Chen, X, Liu, H, and Li, S (2009). Overview of research progress on peanut (Arachis hypogaea L.) host resistance to aflatoxin contamination and genomics at the guangdong academy of agricultural sciences. Peanut Science. 36, 29-34. Liang, Y, Baring, M, Wang, S, and Septiningsih, EM (2017). Mapping QTLs for leafspot resistance in peanut using snp-based next-generation sequencing markers. Plant Breed Biotech. 5, 115-122. McCough, SR, and Doerge, RW (1995). QTL mapping in rice. Trends Genet. 11, 482-487. Moretzsohn, M, Hopkins, M, Mitchell, S, Kresovich, S, Valls, J, and Ferreira, M (2004). Genetic diversity of peanut (Arachis hypogaea L.) and its wild relatives based on the analysis of hypervariable regions of the genome. BMC Plant Biol. 4, 11. Peterson, BK, Weber, JN, Kay, EH, Fisher, HS, and Hoekstra, HE (2012). Double digest RADseq: an inexpensive method for de novo SNP discovery and genotyping in model and non-model species. PLoS One. 7, e37135. Ravi, K, Vadez, V, Isobe, S, Mir, RR, Guo, Y, and Nigam, SN (2010). Identification of several small main-effect QTLs and a large number of epistatic QTLs for drought tolerance related traits in groundnut (Arachis hypogaea L.). Theor Appl Genet. 122, 1119-1132. Sharp, GL, Martin, JM, Lanning, SP, Blake, NK, Brey, CW, and Sivamani, E (2002). Field evaluation of transgenic and classical sources of wheat streak mosaic virus resistance. Crop Sci. 42, 105-110. Shirasawa, K, Koilkonda, P, Aoki, K, Hirakawa, H, Tabata, S, and Watanabe, M (2012). 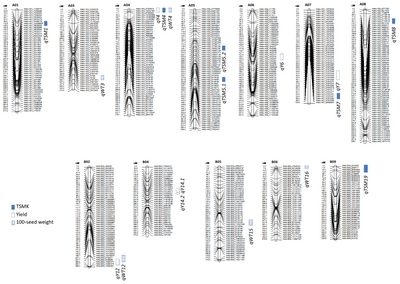 In silico polymorphism analysis for the development of simple sequence repeat and transposon markers and construction of linkage map in cultivated peanut. BMC Plant Biol. 12, 80. Simpson, CE, Baring, MR, Schubert, AM, Melouk, HA, Black, MC, and Lopez, Y (2003). Registration of ‘Tamrun OL01′ peanut. Crop Sci. 43, 2298-2299. Smith, OD, Simpson, CE, Black, MC, and Besler, BA (1998). Registration of ‘Tamrun 96’ peanut. Crop Sci. 38, 1403. Van Ooijen, JW (1999). LOD significance thresholds for QTL analysis in experimental populations of diploid species. Heredity. 83, 613-624. Varshney, RK, Bertioli, DJ, Moretzsohn, MC, Vadez, V, Krishnamurthy, L, and Aruna, R (2009). The first SSR-based genetic linkage map for cultivated groundnut (Arachis hypogaea L.). Theor Appl Genet. 118, 729-739. Wang, H, Pandey, MK, Qiao, L, Qin, H, Culbreath, AK, and He, G (2013). Genetic mapping and quantitative trait loci analysis for disease resistance using F2 and F5 generation-based genetic maps derived from ‘Tifrunner’ × ‘GT-C20’ in peanut. Plant Genome. 6, 1-10. Wehtje, G, Walker, RH, Patterson, MG, and Mcguire, JA (1984). Influence of twin rows on yield and weed control in peanuts. Peanut Science. 11, 88-91. Wheeler, TA, Choppakatla, V, Porter, DO, Schuster, GL, BGM, , and Schubert, AM (2012). Irrigation rate and fungicide effects on peanut kernel damage, yield, and net return. Peanut Science. 39, 88-94. Whitaker, TB, Dorner, JW, Lamb, M, and Slate, AB (2005). The effect of sorting farmers’ stock peanuts by size and color on partitioning aflatoxin into various shelled peanut grade sizes. Peanut Science. 32, 103-118. Wu, Y, Bhat, PR, Close, TJ, and Lonardi, S (2008). Efficient and accurate construction of genetic linkage maps from the minimum spanning tree of a graph. PLoS Genet. 4, e1000212.